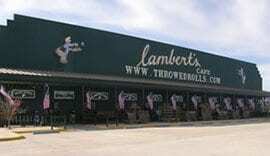 On Lambert’s homemade “Throwed” rolls last year, we used 23,760 – 44 oz. cans of sorghum molasses. Every week we bake over 2,400 of the biggest, tastiest cinnamon rolls that ever passed your lips. Sooooo big we call them “Hubcaps”. 15,900 gallons of milk are used annually as a drink and for cooking and baking. 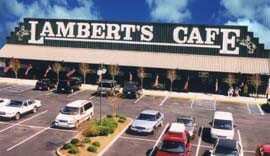 We’ve been told that it takes approximately 17 cows, working night and day, to supply the milk we use at Lambert’s. We hand washed, wrapped and baked over 68,000 potatoes. Along with 33 tons of French fries. Also we used over 130,480 pounds of onions in ole Norm’s fried potatoes. That’ll bring a tear to anyone’s eye! What started as a lark turned into a gigantic job. 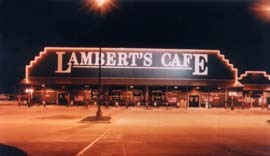 We used to pass okra on occasion but the patron’s of LAMBERT’S CAFE decreed that it should be passed every day, at every meal. Last year alone we cooked and fried 73,440 lbs. of Arkansas okra which was distributed to our customers. Once we just served jowl for breakfast but lately we’ve been offering it on our dinner menu too. What a response hog jowl received. We now serve over 399 pounds per week or 20,785 pounds a year. It’s sugar cured and aged to perfection and to just be honest – bacon just “don’t” compare. Try it on your next visit. More than half the people of the world depend on wheat as one of their basic foods and more of the earth’s surface is covered by wheat than by any other food crop. Of course, the most popular wheat food is bread, which brings us to Hot Rolls. Our ovens turn out rolls from 9:15 a.m. to 9:00 p.m. usually without stopping. With this in mind we thought you might be interested in the following: last year we averaged baking 520 dozen rolls per day, for a grand total of 2,246,400 individual rolls. Our rolls are 5 inches in diameter and if we laid all the rolls that we baked in one year side by side, we would have 177.27 miles of rolls. In the past 21 months we have baked enough rolls to reach 300 miles. That’s the distance between St. Louis, Missouri and Memphis, Tennessee.